On occasions when you celebrate birthdays, or anniversary, or some significant events, food and drinks are invariably a part of it. It is easier to make friends over a glass of drinks than in any other way. Are you thinking about a forthcoming celebration and perturbed about your extensive cutlery? You need not worry at all. You can use appetizer plates and drink holders made of inexpensive materials that are not as brittle as the glass or china clay items used for such occasions. Pertinent question for you is where to get the best meet and greet appetizer plates and drink holders for the purpose. It is quite simple. 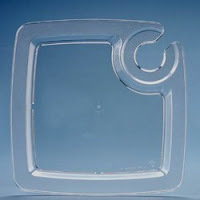 A reliable provider will get you the best plates with drink holders that would serve your purpose beautifully. Best items for you would be such that would fit for any occasion. Especially if the party is designed for standing and mingling while eating or drinking, specially designed items will be ideal for the occasion. When you are not drinking from the glass or cup you could just insert into the designed slot of your drink holder. Quality appetizer plates used for meet and greet occasions would have enough depth so that the sauces and dips would stay on your plate as long as you like. They will not spill on to your body or dress spoiling your appearance and the party mood. These items also fulfill your requirements for stylish designs or attractive upfront quite nicely. Eloquently designed and appropriate for most formal occasions, these plates and holders are a host’s convenience and guest’s delight. The best part of it is that they look like their real time glass counterparts and are at least as shiny and elegant looking in their appearance. It however, is necessary that you find out a reliable provider to supply you these items. Your job is therefore cut out to finding the efficient and experienced provider who will provide you with appetizer plates and drink holder for the meet and greet occasion without making you shoot over your budget.